The William Secord Gallery specializes in the sale of the fine nineteenth and twentieth century dog and animal paintings. We also represent selected contemporary artists such as Christine Merrill, Pamela Dennis Hall and Liza Todd Tivey. The only gallery of its kind in North America, it was established by William Secord in 1990. Since then, it has become a popular destination for those interested in original dog paintings, works on paper, sculptures, books on dogs or commissioning a portrait of your pet. William Secord is the world authority on the nineteenth century dog painting. He is the first author to explore the representation of the dog from its origins to the remarkable paintings of the eighteenth and nineteenth centuries and up to modern times. Secord was the founding director of The Dog Museum of America and is the author of several books: "Dog Painting, 1840-1940, a Social History of the Dog in Art", "Dog Painting, The European Breeds", and "A Breed Apart, The Art Collections of The American Kennel Club and The American Kennel Club Museum of The Dog," and "Dog Painting, A History of the Dog in Art." He co-authored “Best in Show, The Dog in Art from the Renaissance to the Present”, a catalogue published by Yale University Press. Secord's latest book "The American Dog at Home, The Dog Portraits of Christine Merrill", features 33 of Merrill's clients whom Secord interviewed around the country, photographing them with their dogs and their collections. Collectors include conductor Leon Fleisher, interior designer Bruce Bierman and best-selling author Barbara Taylor Bradford. All books are available at the gallery and on our website. 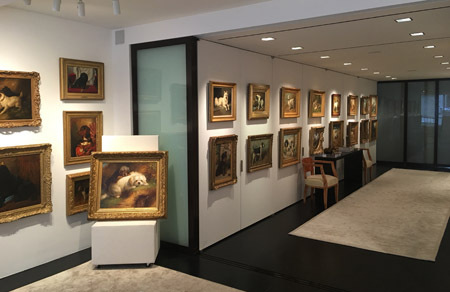 Whether it is an antique dog painting, an antique walking stick, a 19th century French bronze, or a portrait of your favorite pet, there is always something of interest at our gallery. For a dog lover it’s a must! Our web site is constantly being updated with new items. Please visit our site where you can search for your favorite breed, your favorite artist, see new acquisitions or view our entire inventory.